Vortex Optics is an American family-owned company that offers a wide variety of telescopic sights ranging from binoculars to riflescopes. The company’s scopes, in particular, are quite popular due to their incredible features and reasonable price points. However, many scope buyers often question where Vortex products are made. This concern stems from the fact that a lot of US riflescope brands don’t make their products from scratch these days. As a result, concerns about quality are rife among scope buyers. Vortex Razor HD: These Vortex scopes cost the most but the good news is that they’re not as expensive as other brands. Being their premium line, Vortex develops Razor HD scopes with high quality standards and optics designed to provide excellent performance. Vortex Viper: The Viper line is the second best offering that Vortex has under its belt when it comes to riflescopes. Viper scopes offer great quality compared to a number of similar scopes from other brands in their price range. These scopes also provide more magnification and precision in shooting. Original models such as the 30mm 6.5-20×44 and 6.5-20×50 were well-built and are still good scopes. However, you can find better configurations in recent Vortex scopes such as the Viper HS and Viper PST models. Vortex Diamondback: Diamondback scopes are available at cheaper prices than the Viper or Razor HD models. The glass is well-designed and Diamondback scopes are known to have a large field of view and high magnification. Vortex Crossfire: The Crossfire line, including the Crossfire II, is on the lower price range of Vortex scopes. However, the quality is still very good and buyers get to choose from a wide range of configurations. Maybe a more direct question is, are Vortex scopes made in the USA? While Vortex claims on its official website that all their products are designed, engineered, pre-inspected, and serviced in-house, labels on their scopes indicating the manufacturers’ locations say something quite different. It may come as a surprise that an American-owned company, located in the USA, sells riflescopes that have been manufactured overseas. But this is common in the optics industry where many trade name companies buy components from a manufacturer and then put their name on it. In fact, very few optics companies engineer and build their riflescopes in-house these days. And while Vortex doesn’t make their products, they do have the expertise and are able to tell optics manufacturers exactly what they want. All of Vortex’s custom designed scopes are made according to their specifications. The question of who makes vortex binoculars, spotting scopes and rifle scopes has one simple answer. Vortex does. And, Vortex is in Barneveld, Wisconsin. Does It Matter Where Vortex Optics Are Made? This is a controversial topic that has elicited many divided opinions. On one hand, you have companies that sell whatever they can outsource overseas and assemble cheaply. Such brands sometimes compromise on the quality of their scopes on the premise that they’re giving buyers lower prices. With most cheap riflescopes being made in Asia, this has led many scope buyers into thinking that the vast majority of Asian-made products are of poor quality, which is not entirely true. On the other hand, there are optics companies like Vortex that do the engineering in-house and then demand manufacturers build what they want. The Sparc is a versatile red dot scope. The Spitfire is a great option for hunting. So, if you’re apprehensive about Vortex scopes being made overseas, simply do your research and choose a model that other users have vouched for. The best part is that Vortex offers a lifetime VIP warranty for all their riflescopes. 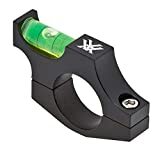 This lifetime warranty goes to show that Vortex is a reputable optics company that believes in the quality of their products and stand by what they put their name on. The Vortex VMX-3T Magnifier is a quick and very effective magnifier that’s quite easy to install and that provides a great quality image. It offers great image quality and construction for a fair price. Read on to learn more about this product and whether it’s right for your needs. The VMX-3T is a very well made magnifier that utilizes a hard-coat-anodized, machined-aluminum construction. It feels solid in the hand and is very durable with a premium build quality and attractive black matte finish. Internal nitrogen purging and waterproof O-ring seals also ensures that it remains waterproof and wont fog up while you’re using it. This also prevents dust from getting inside which could otherwise build-up and render the magnifier ineffective – a common issue for other products. The Vortex VMX-3T utilizes a flip-mount which enables it to be locked in place quickly and easily to provide up to 3X magnification. The crisp image is further improved by the full multi-coated lenses that increase light transmission. Anti-reflective coatings also help. It enables 1/3 or absolute co-witness mounting heights and is a great choice for any hunters looking to increase the range of their red dot sight. The VMX-3T has very positive customer feedback on Amazon where it currently holds a 4.5 star rating based on 162 reviews. Overall, this is a well-constructed product that offers great value for money on Amazon at the time of writing. It provides excellent clarity and magnification and is very quick and easy to attach and detach as necessary. There are cheaper products out there but by choosing to spend a little more you will find there is a noticeable difference in the end result. Rifle scopes are really important as far as precise and sharp targeting is concerned. When it comes to good quality rifle scope, Vortex SPARC Red Dot Scope is a very popular name. This scope has received high ratings from most of the consumers who have used it. But is it really that good? The review of the Vortex SPARC Red Dot Scope given below will help you get an objective view of this unit. This particular rifle scope comes in a one piece tube. The optics you will find in this unit are fully multi coated. The rifle scope is also parallax free. It has a high caliber rating and the dot intensity in this scope is highly adjustable. It offers four separate mounting heights for user’s convenience. You also get a decent enough night vision mode on this rifle scope and a pretty good battery life – both in daylight vision and night vision mode. Is Vortex SPARC Red Dot Scope good enough? As we saw above, this rifle scope comes with many features. The different elevation mount options make shooting comfortable for everyone. The lens on this scope is quite clear and bright. The high recoil caliber rating has been tested for a 1000 rounds, and is hence very dependable. The dot intensity has ten different illumination settings. So, regardless of light conditions, you are bound to get a very good targeting experience. Besides, the parallax free feature helps you to shoot continuously, while keeping both eyes open. This unit is highly durable and the control buttons are laid out in an easy and uniform way. The magnifier on this device is crisp and zooms 2x. Overall, we are talking about a rifle scope that truly turns out to be an excellent option at a very decent price. 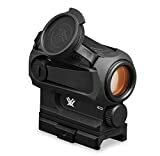 If you are looking for a versatile red dot scope with great features, durable and with a very good value for your money, then the Vortex SPARC Red Dot Scope would be a great match. You will not be disappointed.